1. #1 Straight tool - this is designed for opening up the inside of the hollow form, predominantly around the bottom and side segments. 2. #2 Swan necked tool - this is intended to clear out the intermediate area between the base segment and the undercut area at the vessel top. 3. #3 Swan neck tool - this has a more extreme neck and is used specifically for reaching into the most difficult areas within the hollow form, the shoulder area under the neck. All the tools are made from solid stainless steel plate and CNC machined and polished on all surfaces, except the bottom side of the tools which are supplied with a Carbide Cutter. Cutter replacement sizes are machined into the top of the bar. They are supplied handled. The #1 is 12mm (1/2in) square and 535mm (21in) long, the other two tools are 20mm (3/4in) x 10mm (3/8in) and 575mm (22 1/2in) long. 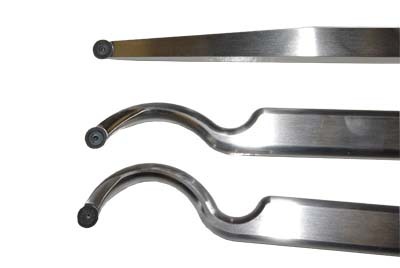 Unlike some hollowing tools, the Mid-Size Easy Hollowers are designed to work from a normal flat toolrest; the two swan neck versions need a working distance between the work and the toolrest of around 75mm (3in). 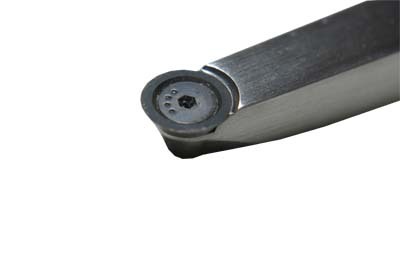 This ensures the wide tool bar is on the toolrest rather than the neck of the tool. I undertook three tests: The first was on a side grained elm (Ulmus procera) bowl. At around 125mm (5in) in both diameter and depth the only tool required on the inside was the #1 Hollower. 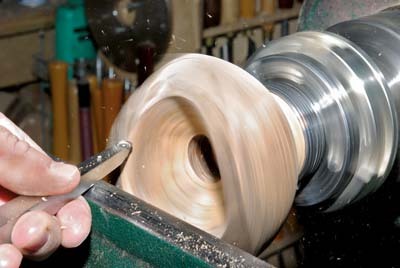 With a lathe speed of 1,200rpm the cut was clean and the tool was equally happy on both push and pull cuts. As the cutter is round, this gave the added benefit or doing away with bevel angle or bevel rubbing issues at the bottom of the bowl. 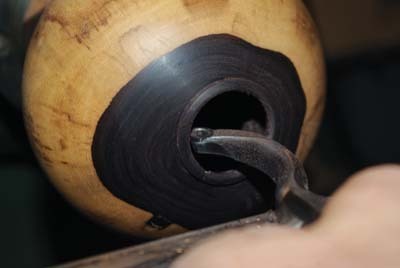 The second test was on an end grain African Blackwood (Dalbergia melanoxylon) vessel at 125mm (5in) high and the same diameter; I felt this was at the limit of the tool's ability to overhang the toolrest. I drilled a 10mm (3/8in) hole down the centre of the vessel to the required depth. At 800rpm the #1 Hollower was used first to open out the neck at 25mm (1in) to the full depth of the vessel. I was surprised just how much of the inside could be accessed by the #1 Hollower, although there does need to be some care taken not to use the neck as a fulcrum point. The #2 tool was then used from the top downwards to open out the inside. Once there was sufficient room the #3 was used to undercut the neck and top 20% of the vessel. In the event I think I could have managed with the #2 tool but the greater access provided by the #3 did make the job a little easier. 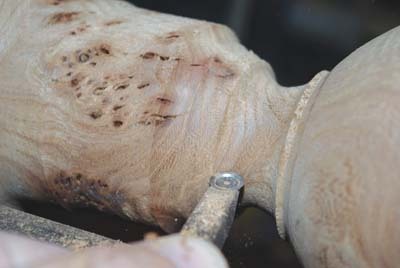 The third test was again on elm (Ulmus procera), but this time an end grain goblet. With 180mm (7in) outside the chuck at 1,400rpm, the #1 performed effortlessly. The eternal question of how to remove the pip in the bottom of the bowl was solved, it was virtually impossible to create one, even when trying. The cutter was so easy to control, vibration was nearly nonexistent and the finish as good as a gouge. I tried the #1 on the outside of the vessel - conventional spindle work - and it performed well. This is a tool that cuts coves effortlessly. All cuts should be started with the cutter just on centre with the handle slightly raised. The cutter needs to be moved slowly through the cuts, giving time for the cutter to work without it being forced into the wood; this gives a better finish to the cut. The cutters do remove wood at quite a fast rate and care needs to be taken to watch the vessel wall thickness, as it disappears quickly. The cutters appear to work equally well on either a push or a pull cut. I would suggest, as with many tools, you take some time to get the feel of things; choose an open form until you are comfortable with the action of the cutter. Don't try to work within a closed form until you feel ready and then make your vessel opening large enough to work through easily. The manufacturer suggests that a dual cutter approach could be taken to the tool, with one cutter being used to undertake the initial roughing out work and the second being used only for the final finishing cuts. The cutters are not designed to be sharpened, but as they rotate around 360°, I think they will provide a fair life span. These Mid-Size Easy Hollowers work well up to around 125mm (5in) in diameter, which will suit many turners. I already own a Ci1 Easy Rougher and was ready to be amazed with the sharpness of the Carbide Cutter. These appear to start sharper than anything else I have used and retain their edge long after I would expect them to have lost it. My only minor criticism is that the handles are supplied highly polished and my personal preference is for a flatter finish. These tools are remarkably easy to use and may remove an inexperienced turner's apprehension at the thought of trying a hollow form. It occurs to me that they are a little like switching from a manual to an automatic car. Overall, was I impressed? Yes, definitely. I have used the Easy Rougher and the larger hollowing tools and found them deceptively easy to use despite my purist self thinking that they should not be that easy to use, or cut as well as they do. Well, these do the same. They are stable, easy to use and the cutters last a very long time. The denser the material, the cleaner the cut off the cutter.